After looking into it more, turns out there are a lot of people also wanting to get to near space; many have published their stories and results in great detail. I have posted the links to some of the best sites at the end of this post. There are a number of sites now on the web which detail how they built their payloads, from the most basic to the very advanced. You have to do a lot of research and testing, re-testing, test again, oh, and then test. And you’ll still have problems. As it turns out – it’s complicated to send something into space, and more importantly recover it, if you’re not a rocket scientist! Since our goal was Near Space Imagery, we started out fairly basic as well, learning as we went from other HAB enthusiasts. We modeled our design similar to the image, with the exception of any second payload in the train which many use for HAM radios and more advanced avionics. We don’t have our HAM license yet, but we’re working on that. For the Parachute, we went with the 4ft – which shows a 3.0lb weight specification, and our goal was to be less than 3 lbs. The filling apparatus was a challenge, and we’re still working on improving it. We needed to find a way to convert compression threading to brass threads, and find the right tubing. The PVC was easy enough, but still leaks. Our second version seemed to be working a little better. We used air compression hose and some quick connectors, then found a compression to brass thread fitting, and set that into the pvc fitting. I found this helium tank regulator on the internet, which we then added a quick connect for the hose. There are a couple of ways to measure the neck lift. For our first two launches we have used a digital scale – but have not had great luck, so for our next one, we’re going with a water jug filled to our neck lift. Tie an emergency line from a heavy object at your launch site (I can’t stress this enough, since our first launch, we let the balloon go by accident and didn’t have a safety line – oops), to the bottom of the digital scale. Tie another line from the top of the digital fish scale directly to the neck of the balloon. When filling the high-altitude balloon stop filling periodically and check the lift indicated on the digital scale. 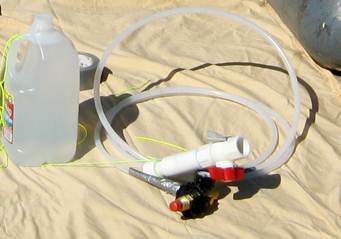 The second method of measuring nozzle lift is to fill containers with water to equal the nozzle lift required. 1 gallon of water is 8.35 lbs. Several used a Styrofoam beer cooler, but we opted to go with a more sturdy and smaller design for ours. 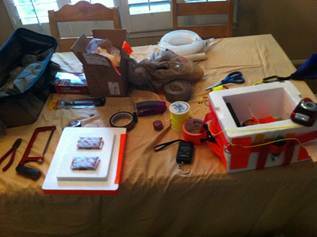 We added a waterproof “Lost and Found” note similar to this http://www.thefintels.com/aer/b32.jpg to the top of the payload. 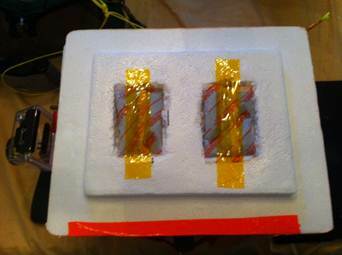 Chemical hand warmers to keep electronics warm. You can find these at sporting goods stores. Awesome camera! Durable, waterproof, shoots full HD. Battery only last for about 2hours though, even with the double battery we used on our second flight it only lasted 3 hours – however most flights should be only 2-3 hours. We used CHDK, to program the camera’s to take pictures every 12-15 seconds. This took us awhile, to find the right settings. We spent about a month testing, modifying the scripts, and testing again to get the right mix of settings on the camera and the script to function the way we wanted. The MT-AIO: a complete, self-contained, rugger, water resistant, portable, 10-watt APRS tracker, including a frequency agile 2-meter transmitter, a TinyTrak3 controller chip, a Byonics GPS3 GPS receiver, and an SMA antenna. We both received our HAM licenses (KJ6UXA, KJ6UXB), which is required to use APRS units. JHAB3 included the MT-AIO and it worked flawlessly. This was a cool little device we found on the internet to test Temperature, humidity. It’s a USB device which can be configured to record at specific intervals. We put it on the outside of the capsule since we used the camera logs to record internal template. 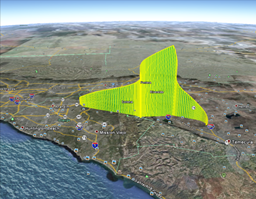 This was the best site we found http://habhub.org/predict/ to run flight predictions based upon payload and wind patterns. You can run as many predictions are you need, and then save the file as a Google Earth KML format. There are many, but here are several of the sites we used for inspiration, and information. My family and I are looking to get into the near space business too. I thought it would be a great experiment, and a great way to get my kids interested in science. I wanted to know if you have been able to exceed 130,000 feet? Thanks again for putting everything online, we look forward to planning our first flight! Shawn, great to hear. It’s a fun hobby. Reach or exceed 130K? – no, our highest has been about 111K – it would be hard to do in So Cal but might be interesting to try. i really like the quality of your pics – I am working also on such a project an would ask you kindly if you would share your chdk script? And also one question on heating – did you extra heat the cams or just used the 2 chemical hand warmes seen on the pic? Just the hand warmers – they work great! It’s a really awesome thing that you’ve done here, and I’m planning to do something like it with a friend. But I’ve got a question about the VOLTCRAFT DL-181THP Logger: Does it simply record the data inside itself so that you can plug it into a computer and see it there? Stupid question maybe, but we need to know for sure. Yes, it’s self contained and simply a data logger of temperature, humidity, air pressure. It comes with software where you can configure the recordings as well as read and download the data via the USB connection. Best of luck on your flight! One more thing: Is the GoPro camera so durable that it can be hung on the outside of the capsule and sent to the stratosphere, or does it just happen lie there in the picture? Yes, very durable. Can be mounted on the capsule. Hello again! I’ve almost collected all the parts I need, but I’m wondering whether you mounted the antenna of your MicroTrak horizontally or vertically. At the moment, mine is horizontal, but I’m wondering if that’s effective enough. Think of it as a Tie Fighter – Vertically – if you’re using the dipole we use. Do you pay an annual fee for your gps? If so would you recommend on with no fee. Depends upon what you use for a GPS – but yes we try to keep our expenses down, so we don’t pay any recurring fees. We’re using the HAM radio’s now with the GPS so there are no recurring fees. Great info! Thanks! I’m working on figuring out what is the best (easiest) GPS to use without HAM. Did you guys use the SPOT and if so could you recommend it? Other option I was looking at was an old cell with instamapper. What is your thoughts? love the vids and the site! Also, with the amateur radio beacon, do you get real time tracking the whole time? Does that include the altitude? If I had just the beacon I can track it via online/website only, right? The flight predictor gets us within a few miles, as long as your flight matches the data you put into the prediction module. Another good resource site is http://www.cusf.co.uk/calc/ , we use these two sites together to create our flight plan. With our HAM radio and the ARPS tracker we get real time tracking or lat/long, altitude, speed. 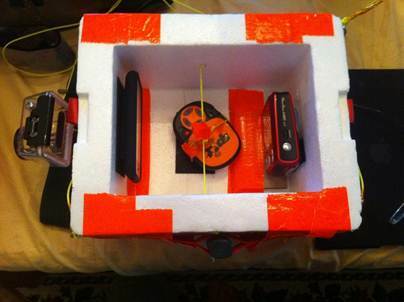 You can follow the flight via http://aprs.fi , and we use our radio and a GPS in the chase car(s) after it lands. Excellent!! Thanks for that info!! The handwarmers….how well did they work when you placed them in the lid? Also, was your GoPro mounted INSIDE the pod or OUTSIDE? Because the balloon loitered for a while at those cold altitudes and the footage looks KILLER and the cam didn’t die! thanks again…you guys are mega helpful! Handwarmers worked great. Kept the inside of the capsule at a consistent temp. We mounted the GoPro outside, as we have two cannon cameras on the inside along with the radio. We used the GoPro case with the defogger. We still have not been able to capture the complete flight with the GoPro, even with the added battery pac, it quits at around 2 to 2 1/2 hours of flight, so we have not captured the decent and landing yet. We’re going to try again by setting a flight plan which has a rapid ascent and shorter flight time. Our next flight however we’re shooting for altitude, shooting for 40,000 meters or more! oh that’s gonna be sweet! Ours is hopefully in November…maybe by Kingman. One last question…How did you rig your pod? Your footage looks way more steady than most of the others on youTube and I’m curious if rigging or stabilizer fins on the pod had anything to do with it. We’re shooting for next weekend – assuming the winds are good. BTW – take a look at http://hint.fm/wind/ awesome site to review wind patterns. The GoPro was mounted onto the side of the capsule, we just got lucky with an early morning sunrise launch and once it got above the jetstream it was very stable. (Going through the jetstream winds can get up to 60mph). I think it was the early launch that may have helped, but also mostly luck. I have seen others try different configs to try to stabilize, but none that I have seen really work. Just part of the fun. will do and good luck on your launch!! I cannot wait to see the next video!! I am planning on doing a flight soon and it will be my first. I was just wondering what kind of cord you guys use? Congrats on your first flight! We use Cortland Planner Board line (200 lb) http://www.fishusa.com/Cortland-Dacron-Planer-Board-Line_p.html . We also use saltwater swivels to connect everything together. Keeps it light. I really liked your past two launches, and thought they were very interesting. I’d like to suggest a new idea for a project. I thought it would be interesting to sample the dust particles in near space, and observe them through an optical microscope. I thought you might like to do this is because, as far as I know, nobody has done this. This would use fairly complex electronics, and you would have to find something clear, sticky, that you could put on an microscope slide, and would not freeze or evaporate in near space for the sample collection period. I think the best time for the sample collection period would be right after the balloon pops, when it is at maximum speed. A good amount of time that you could use for the sample collection period is 30 seconds, which, assuming the payload was falling at 150 mph, would fall 1.25 miles in that period. I hope you do a flight like the one I thought of. I would love to see it. I’m a fan of your site and love all your experiments! Hi JHAB, I’ve just added a new function on the Balloonnews web site. It is a SPOT shared page displaying the SPOT feeds of up to 20 HAB projects that use SPOT from around the world. I was wondering if I could add your SPOT tracker to the page. I think it is also set up so that it records flights for longer than the 7 days that SPOT service provides (but I don’t understand how). Hmm, and if I’m using a rubber duck antenna? I’ve built two capsules that allow for both placements, but I like the tall (vertical) one the best, so if rubber duck doesn’t work vertically, can I find your dipole at Byonics? Vertical is still fine. 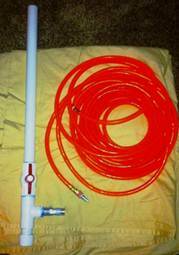 The dipole design can be found at Byonics. Also can you let me know what size tank / how much helium you purchase. I purchased a Kraymont 1,500 gram ballon. Any other tips you can offer would be appreciated. Where can I purchase these parts. I am located in Southern California as well. You can find these at local hardware stores. Regarding gas, this all depends upon your payload weight, balloon size, your altitude goals and flight path. at least 140 cu ft (4 cu m) of gas (the large tank), is needed, and fill to at least 6ft in diameter, but again really depends upon the payload. You can find balloon calculators via google which may also help. This is really cool. I really appreciate the details and making your build notes available. I really want to do this and incorporate some ham radio infrastructure, APRS and maybe a repeater. The projects you have done are very interesting, but you haven’t posted in over a year. Could you please restart the balloon flights? I am launching a HAB for the first time in the next week or two. I am pretty much set with two tracking systems (gps transponder and spot messenger). Two cameras and a GoPro. I am havinng trouble getting a reliable way to keep the spot messenger upright. I build a gimbal but it is heavier then I want for how flimsy it is plus the spot is not center balanced to begin with anyway. I was intrigued by your method and was hoping you could elaborate a bit more on how you did it. I looks like you built a basket and suspended it and let it float there. It is hard to tell in the one picture but this is my next experiment. Could you please tell me more how you did it and was it successful? Any help would be greatly appreciated. Here are a few other examples that others have used – but the hanging string trick worked for us – you just have to have enough room in your capsule for it to fully rotate. just upside down is bad. thanks for the heads up. Looking forward to a launch this sunday. I am planning on mounting the GoPro on the inside to hopefully get better battery life from the insulation, but could you please send me a pic or a post of how you mounted it on the side? For external mounting we used the GoPro mounts on the sides, then used zip ties and tape to mount to the capsule. Please share your post flight results. so we had our launch on sunday and hit 106,860 feet!! We had many successes. There was one big failure. My Spot!!! As soon as we got to the field I powered up the spot and my gps transponder (2M bigredbee at 12dB). have you ever encountered anything or heard anything like this. I plan on testing it at home and play with the wattage on the transponder. but I am at a loss as It is really important to have a secondary tracking mechanism especially when payload is on the ground. you can email me or we can go back an forth on the site for public benefit! Congratulations on your first successful launch and more importantly recovery! 32km is impressive; looking forward to your video and flight data. We had problems with SPOT as well, not the same issues you ran into (haven’t heard of them), but enough where we finally stopped using it. Our APRS unit was so reliable we just didn’t need the hassle anymore. And here is a youtube of the report on local news. I haven’t had the opportunity to edit the video. Great 1080 wide shots. Super clear. Just breathtaking. Really got me hooked. Need to work on better still cameras. Good good pics with canon a3300’s but little grainy on ascent possible condensation? Because the decent pics were perfect and the ground pics before launch were clear. It was a clear day too. Little humidity. Going to look on eBay for some better canon’s to toss up there. Phil, great pictures, and some great local news coverage!. The pictures of you and the kids working on the launch are priceless. Great job, look forward to future launches!